Germline mutations of the POLE gene are responsible for polymerase proofreading-associated polyposis syndrome (PPAP). These mutations were hypothesised to predispose to extra-gastrointestinal tumours (ovary, endometrium, brain), but this association has not been confirmed so far. We report a family with an autosomal dominant inheritance of PPAP due to a c.1089C>A; p.Asn363Lys mutation in the proofreading exonuclease domain of POLE. 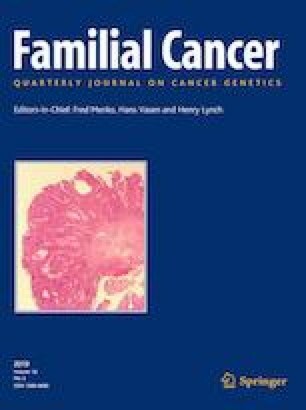 Ten patients presenting a history of colorectal tumours and three patients with polyposis are indexed in this family. Three carriers (including siblings and a distant cousin at 30, 45 and 52 respectively) and another member (at 37 not tested) presented glioblastoma. This is the second family reported to carry this mutation. Among the four glioblastomas in the family that we report, both show similar pathology: giant cell glioblastoma. These cases suggest that the c.1089C>A germline POLE mutation may confer an increased risk of brain cancer [incidence 17.4% (4/23) in mutation carriers combining the two families]. More observations are needed to support this hypothesis. It seems that not all mutations of POLE are equally associated with extra-gastrointestinal tumours. Although carriers of a mutation responsible for PPAP should benefit from screening for colorectal and uterine cancer, due to the rapid evolution of glioblastoma the value of neurological follow-up and brain imaging screening remains questionable. Nevertheless, considering the limitations of standard therapy for glioblastoma, mutation status could be useful for targeting therapy. The biological mechanism linking POLE mutation to glioblastoma remains to be determined. The online version of this article ( https://doi.org/10.1007/s10689-018-0102-6) contains supplementary material, which is available to authorized users. We thank patients and patient families for their participation. We thank Doctor François Labrousse (CHU Limoges) for sharing histological data.